Luis Abrego didn’t even notice when the metal pole impaled his car. He was sitting in the driver’s seat, stopped at the scene of an accident he had just witnessed on the Beltway. He inched forward just a bit, then heard a noise, no louder than the tap of a hammer. And then all of a sudden a police officer was peering in his window, seemingly shocked that Abrego was unhurt. “Yes, why wouldn’t I be okay?” Abrego said. Then he turned around. A light pole had fallen onto his car and pierced it, all the way from the roof down through the floor. And it had only missed striking Abrego in the head by about two inches. 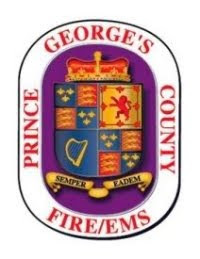 Authorities in Prince George’s County described the incident Monday evening as “bizarre” and said Abrego was very lucky to walk away unharmed. It started when a vehicle on the inner loop of I-495 sideswiped an ambulance near St. Barnabas Road in Oxon Hill. The ambulance was returning to its station on Livingston Road after responding to an incident. Authorities said the vehicle hit the ambulance so hard that the ambulance went off the road and onto a steep, muddy embankment with trees. Abrego, who said he was driving about 15 feet behind the ambulance at the time, stopped short. The ambulance then hit the light pole. That’s what caused the pole to break away from its base and fall over the travel lanes of the Beltway. The pole pierced the roof of Abrego’s car, went through the interior and came out the bottom of the car, according to county firefighters. The light pole missed Abrego’s head “by mere inches,” officials said. “When I turned my neck and I saw the post in the car, I said, ‘Oh my God,’” Abrego said. Authorities said that two medics who were in the ambulance were taken to a hospital to get treatment for non-life-threatening injuries. The vehicle that started the incident by hitting the ambulance went another 200 yards up the Beltway before it stopped on the shoulder of the road, authorities said. That driver was interviewed by police. Officials said they do not yet know whether the driver will face charges. When the incident occurred, Abrego, 60, was driving to his home in Alexandria from his job in Maryland — where he works as a detailer, fixing cars. He has never seen a car damaged quite the way his was. “Never in my life. Believe me, I never saw something like this happen,” he said. When he tried to sleep Monday night, he said he kept seeing that post right behind his head every time he closed his eyes. But he went back to work on Tuesday, to fix other people’s cars. Julie Zauzmer is a local news reporter. Dana Hedgpeth is a Post reporter, working the early morning, reporting on traffic, crime and other local issues.